The demise of the once-storied Kenmore appliance brand is the perfect embodiment of Sears’ collapse. At the start of this century, Kenmore was one of the top appliance brands in the country, and was only available at Sears stores. Sears was the largest seller of other appliance brands too, and it dominated that market. No other retailer was even close. Kenmore had such brand cachet that appliance makers would design some of their best products using the Kenmore name instead of their own. They were eager to stay in Sears’ good graces so they could sell their own products at the popular department store. Many launched their newest and best features on Kenmore appliances instead of their own. “When Whirlpool came up with an idea, the first time customers saw it was often on a Kenmore product,” said Mark Cohen, the director of retail studies at the Columbia Business School and a former CEO of Sears Canada. That’s no longer the case. 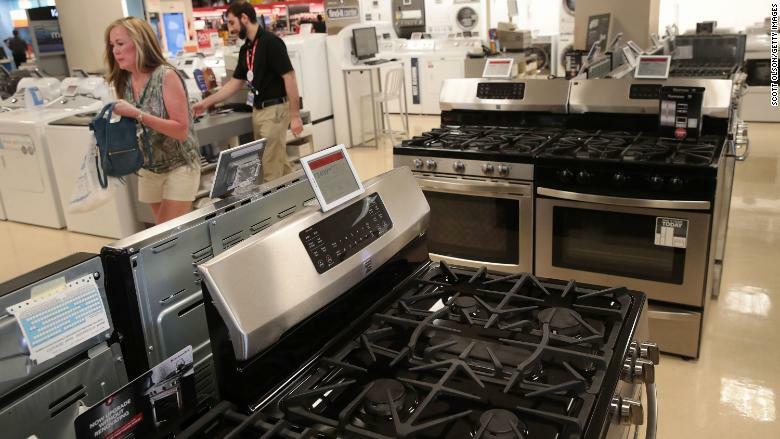 Experts say Sears’ share of the appliance market is a fraction of what it once was. And Sears and Kenmore have become an afterthought for appliance manufacturers. “Whirlpool didn’t stop innovating, they just stopped using Sears as the launch partner,” said Cohen. That has left Kenmore products uncompetitive. “It’s the equivalent of a flip phone in the smartphone era,” said Sean Maharaj, director in the retail practice at consultant AArete. Whirlpool (WHR), a company that got its start more than a century ago by selling at Sears, pulled its products from Sears stores last year, along with its Maytag, KitchenAid and Jenn-Air brands. The power dynamic between the Whirlpool and Sears completely turned around. Whirlpool said that Sears accounted for only 3% of its sales worldwide. Fifteen years ago, Sears valued Kenmore at $2 billion, according to retail consultant Steve Dennis, who was once vice president of corporate strategy for Sears. Dennis said Sears had conducted the analysis in case it wanted to sell the brand. Now Sears CEO and primary shareholder Eddie Lampert is offering to have his hedge fund buy Kenmore for just $400 million. The independent members of the Sears board are weighing that offer. A Sears spokesperson said it’s not clear when the company will make a decision on Lampert’s offer for Kenmore. He also couldn’t comment on past or current market share or revenue numbers for Kenmore or overall appliance sales. As much as the value of Kenmore has declined over the years, the value of Sears has fallen even more. Shares of Sears Holdings (SHLD), which owns both Sears and Kmart, lost more than 80% of its value in the last year. The company’s market value is just $150 million. So the Kenmore brand, as battered as it is, is worth more than twice as much as its parent company. Amazon (AMZN) and online sales are not the primary problem for the appliance sales. Only about 2% of large appliance sales are completed online, according to research firm NPD’s Checkout E-Commerce data, far below the penetration of other items like clothing or electronics. A year ago Sears reached a deal with Amazon to sell Kenmore on its site for the first time, but it did little to boost sales. Experts say the more serious competitive problem for Kenmore was the rise of big box rivals, such as Home Depot (HD), Lowe’s (LOW) and Best Buy (BBY). The growth of LG, Samsung and other Asian brands hurt Kenmore too. When Sears started to lose market share, it responded by cutting costs, cutting back on research and development and marketing support that the Kenmore brand needed to be competitive. Sears’ store closures have hurt too. The company had 3,500 Sears and Kmart stores when they merged in 2005. There are fewer than 1,000 today. Fewer locations are selling Kenmore products, and customers are concerned about Sears’ long-term future. Those fears only got worse last year when Sears warned that there is “substantial doubt” that it will be able to remain in business, Cohen said.